Greenway Self Park is the newest parking garage in Chicago and the first to generate it’s own energy with spinning vertical wind turbines. You might generally associate parking garages with the stark cement-c0lored monotony that most people despise about urban life. 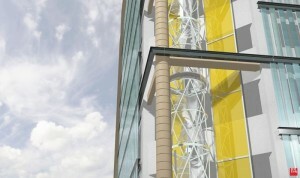 Thanks to a new design by the architects of HOK however, parking garages are being viewed in a whole new green light.